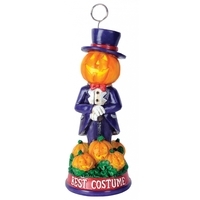 A great trophy to give out for best costume at your Halloween party or event. A happy pumpkin headed man standing in a pumpkin patch with the words "best costume" around the base. Full-color polystone resin. 6 in. tall.